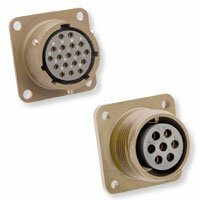 Milnec’s HM and PM Series might look similar, but they are actually two different families of connectors based on the MIL-DTL-26482 and MIL-DTL-5015 military specifications, which each have a number of defining attributes. For example, the HM Series has bayonet coupling while the PM Series has traditional threaded coupling. The HM Series has connectors that can handle up to 13 amps, and the PM Series can take up to 150 amps. The features and benefits of a connector series might be attractive. However, the series you choose is first and foremost dictated by your contact requirements. The series comparison chart below identifies the size and number of contacts that each series can accommodate. If your contacts are available within both the HM and PM series, then you can base your decision on their features, such as threaded or bayonet coupling. However, if the contact size you require can be found in only one series, then your choices may be limited. Let’s continue building our connector. We know from looking at the contact specifications that it must have 3 x #16 contacts and 2 x #12 contacts. After reviewing the the HM and PM Series of connectors on the chart below, we can see that only the PM Series can accommodate #12 contacts. With this information, we now know that our connector must be a PM Series connector. You can learn more about the features and benefits of Milnec connectors. Or, you can continue to step 3, Pick an Insert Arrangement.